Los Angeles Home Builder Roger Perron Completes New Home Construction in Los Feliz » Roger Perron Inc. The Los F eliz neighborhood of Los Angeles has a brand-new Mediterranean-style home gracing its streets, thanks to Los Angeles home builder and designer Roger Perron. 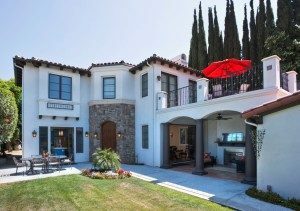 For the last 30 years Perron has been providing design, remodeling, and new home construction to the greater Los Angeles area. Perron designed and built the new Los Feliz home for homeowner Doug S. with a modern Mediterranean theme throughout. The home features Grecian columns, arched entryways, fireplaces in several rooms, dark wood ceiling beams, and an upstairs deck off the master bedroom that has spacious views of the neighborhood. Roger Perron, Inc. is a Los Angeles-based Design-Build firm that specializes in a range of services for homeowners. The company has a licensed architect, a fully-manned construction crew who have worked for Perron for many years, and an in-house interior designer. He and his team are able to handle projects from the very beginning, starting with the first twinkle in a homeowner’s eyes, through to providing every design and construction detail, all the way to the end result of a beautiful, functional and comfortable home. It simplifies the process with one-stop shopping for design and construction. Potential cost savings compared to hiring an architect just for design. Significant cost savings compared to hiring an architect who provides design and construction administration. No disputes between the designer and contractor over design errors or interpretations, or the “right” way to build. This should result in very few change orders or upcharges related to unclear or incomplete plans and specs. Potential cost savings due to a more practical approach to design (since the design-builder is more likely to design with an eye toward construction costs). On the Roger Perron Inc. website, there are dozens of testimonials from his clients and a variety of photos that show his completed work. For the homeowner who wants the best in design and construction, Los Angeles home builder Roger Perron comes highly recommended. For additional information or to schedule a complimentary home design consultation with Roger Perron or his architect visit http://www.RogerPerron.com.